Laibach performed at the Fillmore, previously known as Irving Plaza, on the local stop of what one can only hope is their last-ever tour. 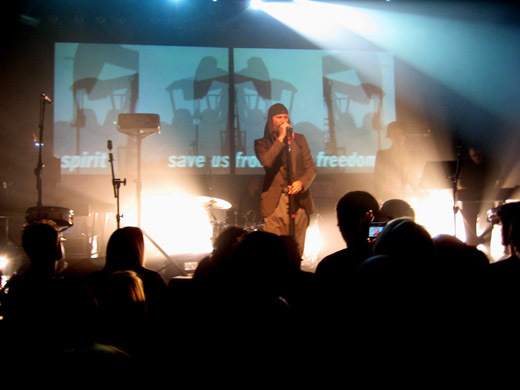 Once an industrial music giant with such unique power and influence as to have actually hastened the break-up of the nation of Yugoslavia, Laibach has become a mere parody of itself. In that sense, parody of a parody. Unfortunately, in its declining third decade, Laibach by now has grossly overplayed that one theme, namely pretending to celebrate militarism and nationalism in order to oppose them. They have dwindled down to just one original member, Milan Fras, the front-man with the ultra-deep bass voice and a female vocalist whose talent is wasted on ineffectively groping for non-existent melodies. Having abandoned the practice of covering and reinterpreting other peopleâ€™s songs, they clearly are not up to the task of writing original music. As a means of disguising their boring, percussive music, they have created an elaborate background show, also uninspired, featuring paired screens on which are projected various, mostly uninteresting images of flags, symbols, words and, stupidly, the film credits for two 60s era, black-and-white Italian movies. Doors were at 8 PM. There were no opening bands. Instead the audience of nostalgia-seeking industrial music freaks was made to stand around until 9:45 at which time the filler videos and DJ music stopped. What followed was another 20 tedious minutes of outright, intentional abuse: Being forced to stare at an empty stage and listen to bombastic, Slavic, martial choral songs— seven in all! Next was the Star-Spangled Banner, played straight yet with hidden contempt, displaying the American flag in video on two screens with its stars replaced by the new Laibach symbol, a stylized, winged letter â€œVâ€ which would appear again and again in the graphics throughout the show. Their entrance on stage was a shocking disappointment for those expecting the familiar cadre of uniformed, stone-faced musicians. Only the charismatic Milan Fras, bearded and wearing his signature headdress, is left of the original group, accompanied by a turbaned female vocalist, Mina Spiler plus a drummer and some electronic accompanists. succeeded in bringing back that brilliant, ambiguous irony when, with mock-sincerity, Laibach sings of the peoples of Eastern Europe as â€œunited and free in great Mother Russiaâ€™s embrace.â€ Coincidentally, it is the only song with a memorable melody. There wasnâ€™t much irony, and even less insight when Laibach stumbled far out of their element to perform abstruse audiovisual critiques of the U.S.A., Israel, China, Japan, Italy and Spain, using that same worn-out ploy: faked admiration. Thus they parodied Spanish pride over conquistadores and they made oblique reference to Mussoliniâ€™s plans for a resurgent Rome. Is this stuff supposed to be relevant? China got ridiculed with the slogan â€œArise,â€ repeated endlessly. And Japanâ€™s lame spoof had something to do with a wavering image of the sun on the two screens. You get the idea: â€œNationalism is bad.â€ We hear you.